WE BELIEVE asset allocation strategies should be established to meet the individual needs of each investor based on their time horizon, risk tolerance and retirement goals. Expected Risk is calculated based on the portfolio's Riskalyze Risk Score. The Risk Score is based on the volatility of the portfolio holdings and can range from 0 to 100, 0 being no risk and 100 being the riskiest. The Strategic Core, Tactical Sectors & Themes, and Culturally Significant Equity strategies are rarely implemented in isolation. More commonly, an investor is allocated between the 3 strategies to create a portfolio that is unique to them; based on their investment goals, personal risk tolerance, investment time horizon, and a variety of other personalized factors. WE BELIEVE diversification is the key to successful long-term investing. WE BELIEVE that investment returns should be delivered in a low cost environment. WE BELIEVE that limiting a portfolio's downside is as important as maximizing its upside. WE BELIEVE it is time in the market, not market timing, that leads to wealth accumulation. We believe in a long-term investing approach where clients are properly invested through full market cycles. WE BELIEVE that understanding human emotions makes us better advisors. WE BELIEVE that ETFs are an important part of every investor's portfolio. In recent years, active managers have dramatically under-performed their benchmarks. In fact, a recent study from S&P reported that, in 2018, 63% of large-cap managers, 54% of mid-cap managers, and 73% of small-cap managers underperformed the S&P 500, the S&P MidCap 400®, and the S&P SmallCap 600®, respectively. 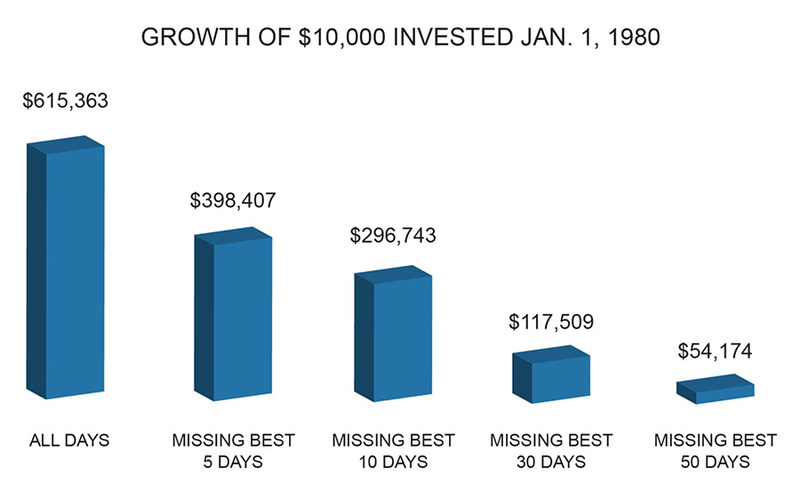 The figures are equally unfavorable when viewed over longer-term investment horizons. So the million-dollar question is: Why compensate mutual fund managers—handsomely, in some cases—if they cannot even match their benchmark, never mind beat it? The answer is don't compensate them! Exchange-traded funds (ETFs), in their most basic form, replicate an index like the S&P 500, or some other collection of equity’s or asset groupings—and at a very low cost. 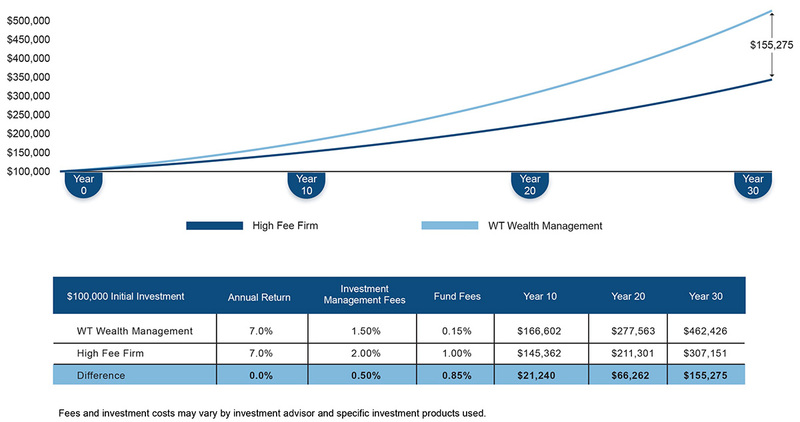 The typical internal cost can be a fraction of what a typical mutual fund manager would charge. At WT Wealth Management, we believe that ETFs are an important part of every investor's portfolio. Studies have shown that most of an investor's returns result from asset-allocation decisions, not individual security selection or perfectly timing the markets. 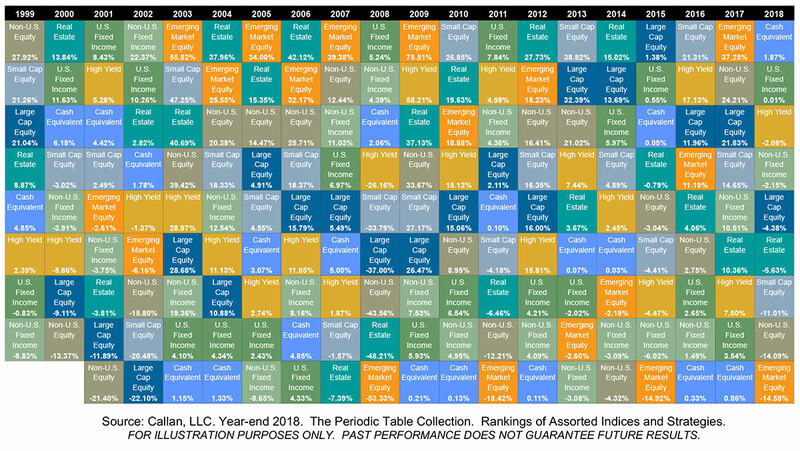 With that in mind, (ETFs) offer precise, efficient, ‘style-drift'-free exposure to a wide variety of asset classes that are essential to the construction of a broadly diversified portfolio. Furthermore ETFs are very reasonably priced and trade in real-time. ETFs are also much more flexible than mutual funds when it comes to managing tax implications and tax burdens on an investor's portfolio.